Thirteen star flags have been made throughout our nation's history and, contrary to popular belief, are one of the most common star counts found on antique American flags. Despite their relative abundance, some 13 star flags fall into an elite group, in that they are practically unique in their design and construction. This 13 star flag of the Civil War era belongs to this elite group and, on all counts, is a masterpiece of early American flag making. The cornflower blue canton and deep red stripes of the flag are constructed of blanket wool, while the stars and white stripes are made of cotton. The design of this canton is known among collectors as the "snowflake" pattern. A scarce handful of small Civil War era printed parade flags in the snowflake pattern have surfaced, but this is the only flag of pieced-and-sewn construction known in this extremely rare pattern. A comparison of this flag to the snowflake parade flag is convincing evidence that the maker of this flag patterned it after its small printed counterpart. Of all American flags known, only a precious few have stars with other than five points. The six pointed stars of this flag further elevates its visual impact and rarity. Although the fly end of the flag appears to be scalloped and seems rough-cut, it is as designed, and serves as a good example of how different amounts of shrinkage in different fabrics within a mixed-fabric flag can alter its form. Most of the flag is treadle machine sewn, so the flag most likely dates to 1850 or later. 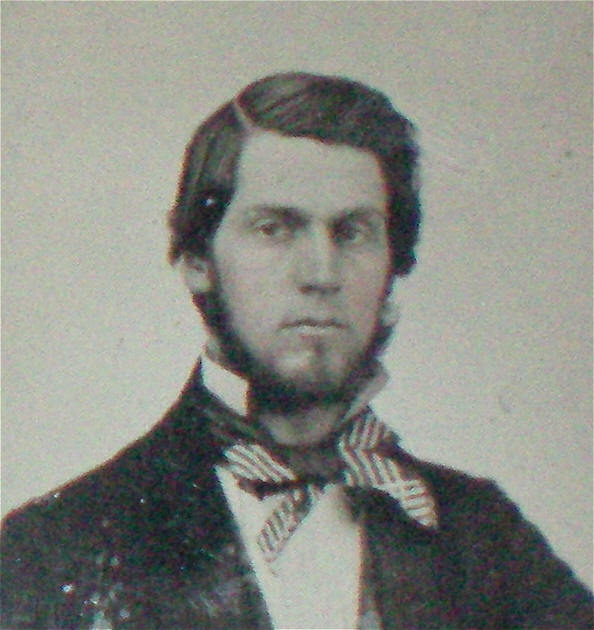 The original owner of the flag, Mr. Leverett Sexton of Middlesex County, Connecticut, died in 1865, which means the flag was most likely made in the fifteen years between 1850 and 1865. The flag's provenance and family history is well documented for such an early flag. The flag belonged to Leverett, who, along with his brother Deming, manufactured iron cow bells in their factory at Pine Brook in Middle Haddam Parish. 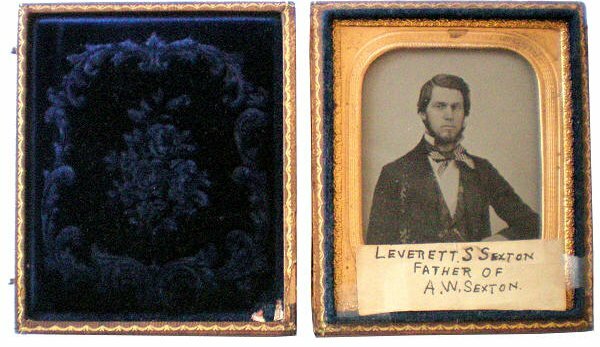 The flag is accompanied by a photograph of Leverett and family papers that date back to the 18th century, and the flag was purchased from Leverett's descendents. All in all, the flag survives as a gem among early American flags. 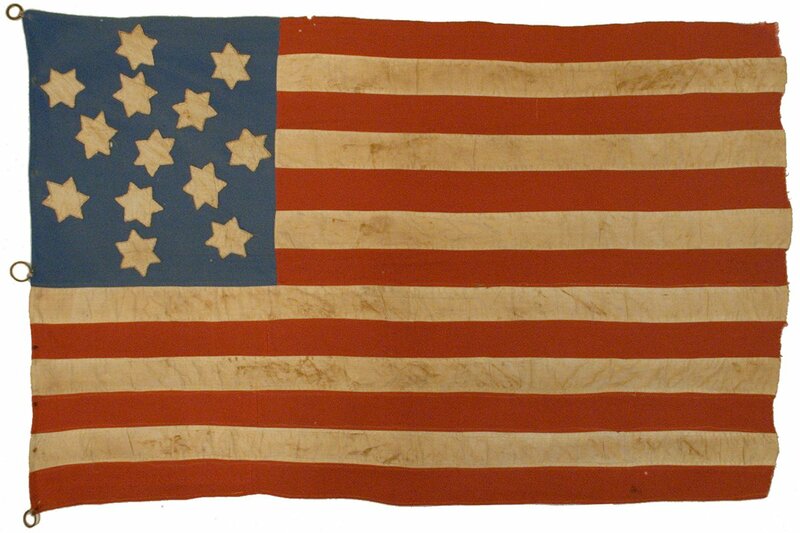 Mr. Leverett Sexton of Pine Brook, Middlesex County, Connecticut was the original owner of this beautiful early American flag.